Want to get out of the daily life and relax for a moment? Come withus, play solitaire and make a journey to the mystery blue ocean.Main features:♠ Classic Solitaire gameplay (also known as Klondikeor Patience) ♠ Optimized for mobile phone play♠ beautiful Themes ♠Clean and user-friendly designs♠ Big and easy to see cards♠ Singletap or drag&drop to move cards♠ Draw 1 card or 3 cards ♠Auto-collect cards on completion♠ Auto-save game in play♠ Featureto Undo moves♠ Feature to use Hints♠ Standard or Vegas scoring♠Timer mode supported♠ Left-handed supported♠ Landscape modesupported♠ Up to 10 top records♠ Offline play and no data cost♠Multiple languages supportedIf you like playing Solitaire on PC orSolitaire classic style then you will love this! This is the bestSolitaire game in hands! Highly Addictive and 100% Fun, DownloadNow for Free!Have a burning question? Send us a message! Classic Gameplay: We kept the game true to the spirit of theclassic Solitaire (also known as Klondike or Patience), andspecifically optimized the game for an unmatched solitaryexperience on mobile phones. Addictive and Challenging: Solitairecard games are fun and challenging puzzle games that anyone canenjoy! Gameplay is very simple to start but hard to master.Millions of users are having fun for hours everyday! BeautifulDesigns: By removing all the unnecessary features, our game is themost easy-to-play with clean and intuitive designs. Meanwhile, wehave added many beautiful themes on top of the classic card gamedesign. Our Game Features ♠Daily challenges with different levels♠Clean and user-friendly menus ♠Big and easy to see cards ♠Singletap or drag&drop to move cards ♠Customizable beautiful themes♠Draw 1 card ♠Draw 3 cards ♠Auto-collect cards on completion♠Auto-save game in play ♠Feature to UNDO moves ♠Feature to usehints ♠Standard or Vegas scoring ♠Timer mode supported ♠Left-handedsupported ♠Landscape mode supported ♠Up to 10 top records ♠Offlineplay and no data cost ♠More features to come! It's completely Free!Download it now, relax and have fun with the best Solitaireexperience! Solitaire is a fun and challenging classic card game that anyonecan enjoy. With Themes and Daily Challenges, you will find ourSolitaire to be the best one. Game highlights: ♤ Classic Solitairegameplay (also known as Klondike or Patience)♤ Addictive andchallenging levels♤ Optimized for mobile phone play♤ More than 100beautiful Themes♤ Play a match against others in real timeMain GameFeatures: ♠ Daily challenges♠ 2 Players Tournaments♠ 4 PlayersTournaments♠ Clean and user-friendly designs ♠ Big and easy to seecards♠ Single tap or drag&drop to move cards♠ Customizablebeautiful themes♠ Draw 1 card or 3 cards ♠ Auto-collect cards oncompletion♠ Auto-save game in play♠ Feature to Undo moves♠ Featureto use Hints♠ Standard or Vegas scoring♠ Timer mode supported♠Left-handed supported♠ Landscape mode supported♠ Up to 10 toprecords♠ Offline play and no data cost♠ Multiple languagessupportedIf you like playing Solitaire on PC or Solitaire classicstyle then you will love this! This is the best Solitaire game inhands! Highly Addictive and 100% Fun, Download Now for Free!Have aburning question? Send us a message! HOW TO PLAY:You will start out with a pyramid of cards, a deck ofcards.The goal of the game is to clear as many boards as possibleby pairing two cards that equal to 13.Kings have a value of 13 andit can be removed individually.Queens have a value of 12, Jacks -11, Aces - 1 and other cards have face value. Once you matched apair of cards, they disappear and you can work with cards fromanother row of your Pyramid, continuing your solitaire till allcards are gone. BEAUTIFUL DESIGN:By removing all the unnecessaryfeatures, our Pyramid Solitaire is the most easy-to-play Solitairewith clean and intuitive designs. Meanwhile, we have added manybeautiful themes on top of the classic Pyramid Solitairedesign. FEATURES:♠Smooth and concise graphic♠Clean anduser-friendly designs ♠Big and easy to see card♠Single tap ordrag&drop to move card♠Customizable beautifulthemes ♠Auto-save game in play♠Feature to UNDO moves♠Featureto use hints♠Timer mode supported♠Landscape mode supported♠Up to 10top records♠Offline play and no data cost♠Multi-languagesupportedWe believe with all the great features, you will love ourPyramid Solitaire! Download for free now and enjoy the best PyramidSolitaire app out there!SUPPORT&FEEDBACK:Have a burningquestion? Send us a message! We will solve your problem as soon aspossible. 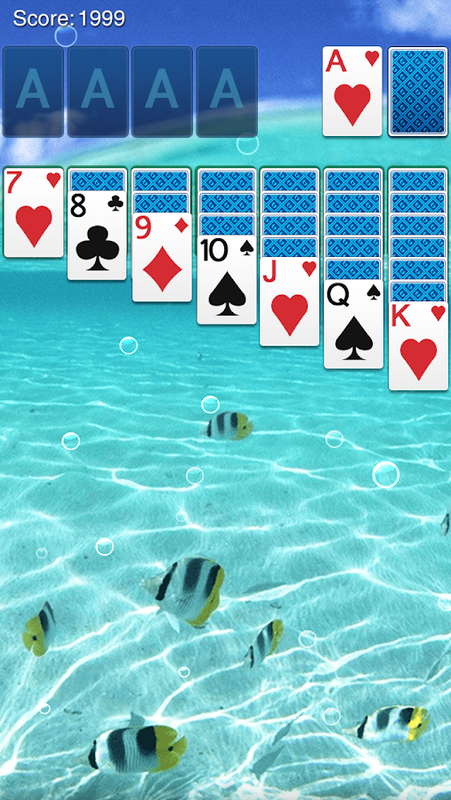 Stay tuned for more free solitaire games! Classic Gameplay: In this Tripeaks Solitaire, we kept the gamestrue to the spirit of classic Tripeaks solitaire(also known as TriTowers, Triple Peaks or Three Peaks), and specifically optimizedthe game for an unmatched Tripeaks Solitaire experience on mobilephones. Addictive and Challenging: On top of the original gameplayof Tripeaks Solitaire, we added tons of new features into the gameincluding Daily Challenges and Themes. We believe with thesefeatures, you will enjoy Tripeaks Solitaire in a completely newway. Beautiful Designs: By removing all the unnecessary features,our Tripeaks Solitaire is the most easy-to-play with clean andintuitive designs. Meanwhile, we have added many beautiful themeson top of the classic card game design. Game highlights: ♠ClassicTripeaks Solitaire gameplay (also known as Tri Towers, Triple Peaksor Three Peaks)♠ Addictive and challenging ♠ Optimized for mobilephone play ♠ Beautiful and customizable themes Our Game Features♠Daily challenges with different levels ♠Clean and user-friendlymenus ♠Big and easy to see card ♠Single tap or drag&drop tomove card ♠Customizable beautiful themes ♠Auto-save game in play♠Feature to UNDO moves ♠Feature to use hints ♠Timer mode supported♠Landscape mode supported ♠Up to 10 top records ♠Offline play andno data cost ♠More features to come! If you like playing TripeaksSolitaire on PC or other Solitaire card games then you will lovethis! This is the best Solitaire game in hands! Highly Addictiveand 100% Fun, Download Now for Free! Have a burning question? Sendus a message!